Are you up to your ankles in water and mud, or tired of walking through puddles to get in and out of your home or business? With 25 years experience, our drainage experts will design a solution to eliminate those wet spots and protect your property from costly water damage.Let our Raleigh NC Landscapers help you today. 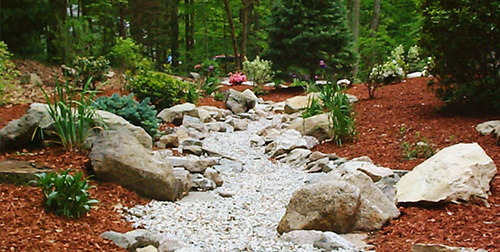 Outdoor Pros is the areas authority in drainage and erosion control services including installation, modification, and repair. We install all types of drainage systems including French drains, Catch Basins, Channel/Strip Drains, Down Spout Piping as well as Full Drain Fields and Embankment Stabilization. Whatever your drainage and erosion control needs may be, Outdoor Pros is staffed and equipped to get the job done right the first time. Drainage problems do not go away, they only get more expensive. Contact us today for your on site consultation. "If water is getting to you, you should be getting to us!"